With almost 1,000 berths available, Torquay harbour is a well-protected yacht haven with access to some of the best facilities in the South West. The harbour is on the fringe of Torquay town centre which provides easy access to shops, restaurants and bars. We were approached by Torquay Habour Authority who briefed us on the design of a visitor information leaflet. The harbour regularly welcomes hundreds of tourists ashore from large cruise ships and they are often whisked away in coaches and buses. The purpose of the leaflet is to promote Torquay as a place worth experiencing for its stunning seafront, stylish marina and contemporary restaurants. 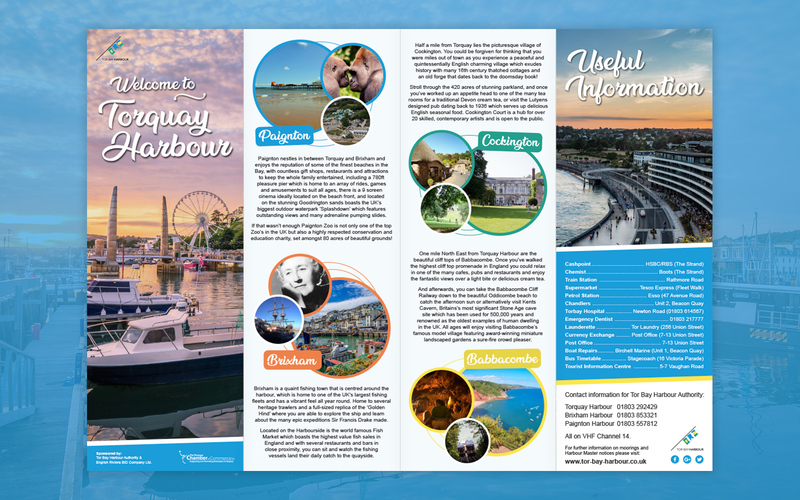 Fruition have done a fanatic job in designing a new leaflet to promote Torquay Harbour, in which we have received such positive feedback from members of the public and council staff alike. They were a pleasure to work with and the combination of creativity and professionalism was exactly what we needed. Working to a tight deadline they were able to take our vision and steer us towards an outcome that we are extremely proud of. The leaflets have been exceptionally well received and we look forward to teaming up with Fruition in the not so distant future! 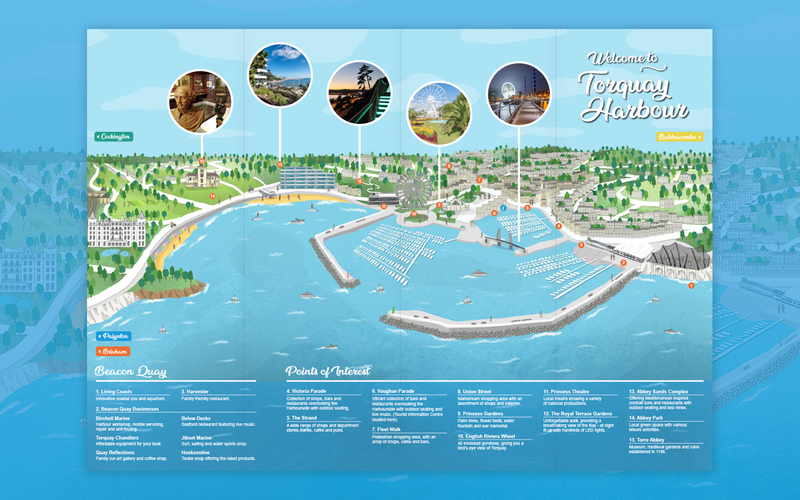 The experience of Torquay harbour and the surrounding area is visualised through the custom illustrated map on the reverse of the leaflet. 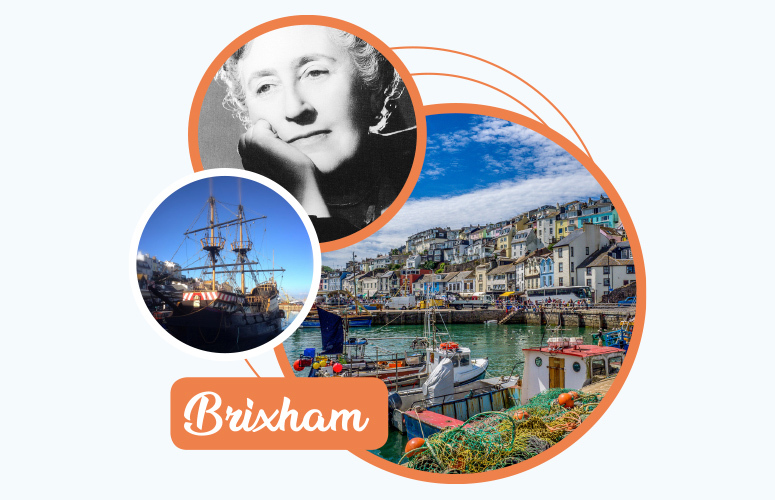 The map shows that a wide variety of attractions, restaurants and bars are all within a short walk of the seafront. On the front of the leaflet Babbacombe, Paignton, Cockington and Brixham, all of which are local to Torquay, are promoted as places to visit. This side also details contact information of local businesses and amenities for those visiting the area. Torquay Harbour Authority is an extension of Torbay Council and as a result, has a fairly strict set of brand guidelines. We worked closely with the client to ensure the brand was adhered to, whilst making the leaflet exciting and engaging. We achieved this through the use of imagery and utilising the Authority’s complete colour palette. Leaflet? Brochure or magazine design? We can help! Please visit our contact page for details on how to get in touch.